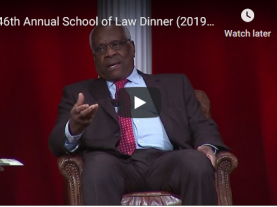 The following contribution to our online VRA symposium comes from Richard H. Pildes, Sudler Family Professor of Constitutional Law, NYU School of Law. Professor Pildes is the co-editor of The Future of the Voting Rights Act, the co-author of The Law of Democracy, and the author of numerous academic articles on voting rights the Supreme Court regularly cites. Congress has put the Supreme Court in an excruciatingly difficult position. The parts of the country the VRA singles out today for Section 5’s unique regime of federal receivership remain essentially unchanged since 1965 (when most of the covered jurisdictions were brought in) and 1975 (when those with certain language minorities were added). In 2006, when Congress adopted the current version of Section 5, nearly twenty-five years had passed since Congress had last re-visited Section 5; many VRA experts assumed Congress would inevitably update the Act in one way or another — particularly its geographic scope — to reflect the demographic, social, legal, and political changes that had taken place since 1982, let alone since 1965. But Congress avoided the provocative and difficult questions these changes unleashed. As Section 5 emerged in 2006, its geographically selective targeting remained unchanged – neither expanded, contracted, nor modified in any way from the contours Section 5 had developed in the 1960s and 70s. In addition, Congress locked that structure into place for another twenty-five years, as long as any extension of Section 5 in the Act’s history. Until 2031, then, the parts of the country put in the 1960s and 70s under the only geographically selective regime of federal receivership in American history will remain there. Thus Congress forced onto the Court’s agenda the question: is there a constitutionally sufficient foundation to justify singling out today (and until 2031) the exact same areas, and only those areas, initially and properly singled out some forty or so years ago? When I testified before the Senate Judiciary Committee in 2006, I was concerned that the evidence in the legislative record did not adequately address whether there continued to be “systematic differences between the covered and the non-covered areas of the United States [,] . . . and, in fact, the evidence that is in the record suggests that there is more similarity than difference.” Congress simply did not seem interested in this question or wanted to avoid it. The legislative process had been designed as if Congress’s only constitutional (and policy) obligation were to establish that race-related problems concerning voting rights continued to exist within parts of the already-covered areas – regardless whether similar problems were occurring at similar rates in other parts of the country. Instead, to be on the safe side of modern constitutional doctrine, which had changed dramatically since Congress had last re-visited Section 5 in 1982, I urged Congress to assess where voting problems were occurring today and tailor Section 5 accordingly. In NAMUDNO¸ the Supreme Court quoted this testimony and concluded that “difficult constitutional questions” existed concerning whether contemporary circumstances justified the current scope of Section 5. Implicitly, the Court gave Congress a second chance to tackle the issues it had avoided. To no one’s surprise, Congress once again preferred to do nothing and leave the status quo intact — thus effectively putting the burden back on the Court. At least three different possibilities exist concerning the foundation constitutional doctrine might require to justify today’s Section 5. Commentary often does not distinguish between these three: (1) taking the covered jurisdictions in isolation, Congress might only have to show that voting problems continue to exist in those areas; (2) taking the covered jurisdictions in the aggregate and comparing them to the non-covered ones, Congress might only have to show significant continuing differences between “the covered” and the “non-covered” areas; (3) taking the covered jurisdictions one by one, Congress might have to show that significantly different problems plague particular jurisdictions to justify their continued inclusion (at least at the state level, as a first cut at requiring close tailoring between Section 5’s coverage and contemporary circumstances). Congress implicitly legislated on the assumption that (1) defined its constitutional obligations, but NAMUDNO appears to signal that the Court is not going to accept that approach. If so, the critical question will be the choice the Court makes between theories (2) and (3) — and how strong the evidence is to support the approach the Court adopts. 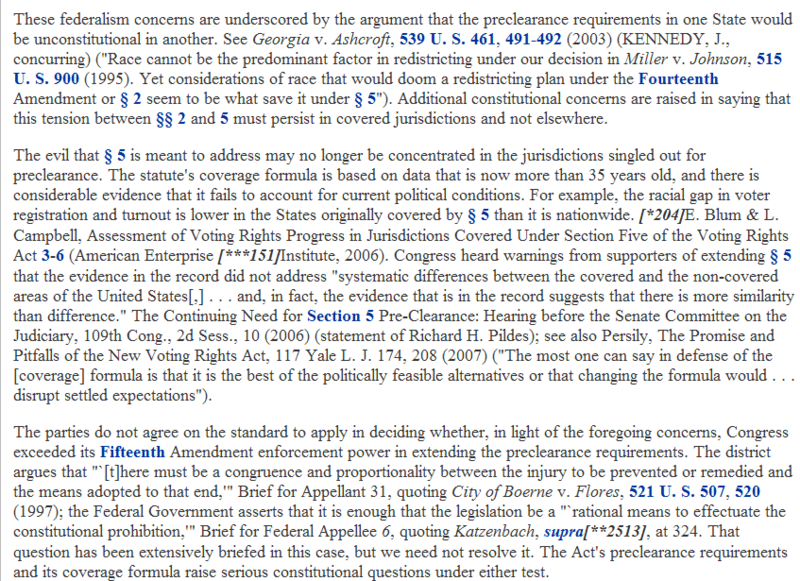 Put more concretely, the question is whether, if unique voting-rights problems continue to infect Alabama, Mississippi, Louisiana, and Texas (if recent three-judge court decisions involving Texas are upheld) but not Virginia, North Carolina, and Georgia, for example, is that sufficient to uphold the constitutionality of Section 5, as (2) would suggest? Or can Congress apply Section 5 only in the former states – if these are the only places where these actual problems distinctively exist, as (3) would require? Moreover, if the Court holds that Section 5 is currently overbroad and valid only in areas where unique problems continue to arise, will the remedy be to strike down Section 5 altogether, which would force Congress back to the drawing board, or will the Court deal with the Act on an as-applied basis and permit it to continue to be applied in states with continuing unique problems? Much turns, then, on the difference between (2) and (3), but it is this difference that is often lost in current debates. 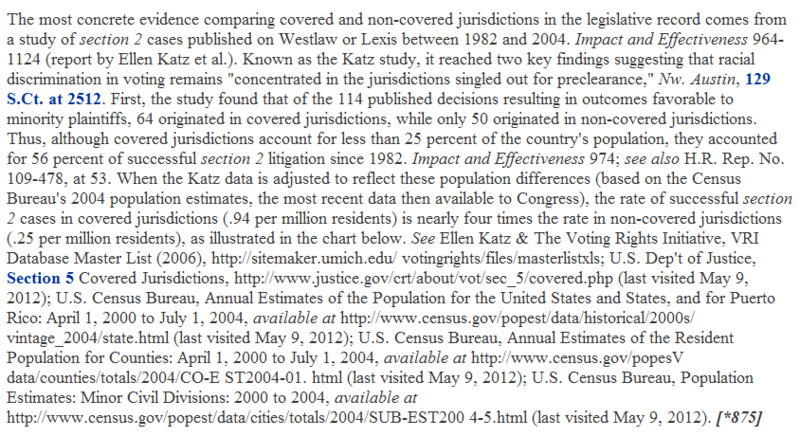 Because Congress was not interested in comparing the covered and non-covered jurisdictions, little evidence in the legislative history exists on these comparisons that shows significant differences even in the aggregate. Thus, even if the Court adopts the less demanding standards of theory (2), the evidence is limited if Section 5 must rise or fall on the record before Congress. Indeed, almost the only evidence is a study by Ellen Katz, but other academics have argued (here, here and here) that even the modest differences that study purports to identify dissolve on closer scrutiny. (Judge Tatel, an exceptionally meticulous and sophisticated judge, did not address these academic criticisms of the Katz study in his two-to-one Shelby County opinion, perhaps because they were not briefed.) But the Court might not limit the constitutional inquiry to the evidence actually before Congress. New voter identification laws, for example, have been passed since 2011 in around eleven states; five states are covered jurisdictions, six are not. The ultimate legality of these laws is still being sorted out in the courts; in the covered states, the Justice Department so far has objected to two of these laws and signaled approval of others. But once the legality of these various laws is fully resolved, what should the Court make of this overall pattern? Under Section 5, of course, the exact same voter identification law that might be legal in theMidwest could be illegal in the South. If we look at other subsequent events and evidence, one obvious juxtaposition, of course, is President Obama’s election two years after Congress concluded not enough had changed to require any modification of Section 5’s geographic scope. The 2008 election has led to simplistic either-or debates: either we have entered a post-racial age, in which race-related problems in voting have largely disappeared, or the problems of the past largely endure and his election has little significance for these issues. Both positions are naïve. A comparison of how President Obama did among white voters compared to John Kerry in 2004 suggests a more nuanced picture; although no two elections are identical, the “falloff rate” when a black rather than white Democrat runs for the same office is one rough suggestion of the extent to which white voters are less willing to vote for a candidate because of race. As work by Professors Ansolabehere and Persily shows, President Obama did as well as or better than Kerry among white voters in five of the nine fully covered states, but he did significantly worse in Louisiana, Mississippi, and Alabama. President Obama performed dramatically better among whites than Kerry in the covered states of Virginia and (partially covered) North Carolina, both of which he won – and dramatically less well than Kerry in Arkansas, although Section 5 does not cover Arkansas. What should the Court make of these patterns? If we aggregate the covered and non-covered states, as theory (2) would suggest, their analysis provides some support for the conclusion that continuing differences remain at the aggregate level. Yet if we focus on individual states, as theory (3) would require, this analysis suggests that a few states remain uniquely problematic. Similarly, intermarriage rates and expressed attitudes towards them have changed dramatically since the early 1980s, when Congress had last revisited Section 5, and are higher in the South than any region other than the West (twenty-two percent in the West; fourteen percent in the South; thirteen percent in the Northeast; eleven percent in the Midwest). None of this is to say that we have reached some kind of interracial paradise, but it does reveal that change has occurred, including in the South. Yet the Court will see none of these changes reflected in a Section 5 whose geographic targeting remains exactly the same as forty years ago. Had Congress modified Section 5 in any way, the Supreme Court might have found it easier to see the reauthorization process as a good-faith effort to honor the Court’s modern Boerne-line of cases at the same time that Congress struggled with a difficult policy problem. In addition to the underlying substantive issues, the 2006 reauthorization process – Congress’s first engagement with major civil-rights legislation since the early 1990s – was a symbolic test of whether Congress was capable of addressing in a complex way the realities concerning the extent to which race and politics have changed and the extent to which they have not. Instead, as I wrote in an earlier article, “Congress has, in effect, thrown down a gauntlet to the Court.” The renewed Section 5 is the same in geographic reach as the Section 5 of the 1960s and 70s. The Court will therefore confront a statute that makes no concessions to the post-1982 Boerne doctrines nor to the social, political, and institutional changes since 1982. Yet Section 5 is not economic legislation enacted pursuant to Congress’s Commerce Clause power. 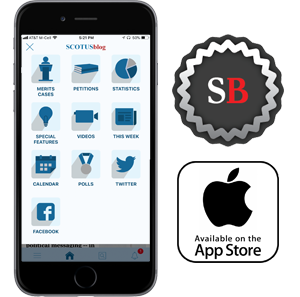 It is legislation that implicates multiple areas in which the Court has insisted that the Constitution imposes a special obligation on Congress to ensure adequate justification for its legislation. Section 5 stands at the intersection of race-conscious policymaking and federalism, the latter in the unique context of geographically specific legislation; the Court has been insisting for many years now, rightly or wrongly, that legislation in these areas rest on an adequate foundation in fact. Perhaps it is time for national voting-rights legislation to shift from an anti-discrimination approach to one that provides more universal protections for the right to vote, as I have suggested, though the hyperpolarization of Congress today makes any such legislation unlikely. As I have chronicled elsewhere, realpolitik provides the best explanation for why Congress left Section 5’s essential structure and coverage unchanged. To try to update Section 5’s coverage would have opened up too many charged questions about where the interaction of race and electoral politics had improved in the country, remained the same, or gotten worse. The question is whether realpolitik will be an adequate justification to a Supreme Court majority that cannot relish the headline, “Supreme Court Holds Voting Rights Act Unconstitutional,” but that has already expressed serious reservations about a Section 5 that extends to 2031 a geographically-selective regime whose targeting remains unchanged since the 1960s and 70s.